The Nissequogue River (named after the local Algonquian-speaking Nissequaq tribe) is an 8.3-mile (13.4 km) long spring-fed river flowing from Smithtown, New York into the Long Island Sound. Its discharge of 42.2 cubic feet (1.19 m3) a second is the most of any of the freshwater rivers on Long Island. Running through Caleb Smith State Park, fishing operates on a 'beat' system. Anglers will have to call ahead an reserve a spot on the river at (631) 265-1054. Fly fishing only. The park receives approximately 1,000 stocked brown and rainbow trout annually, as well as hosting a wild brook trout population. 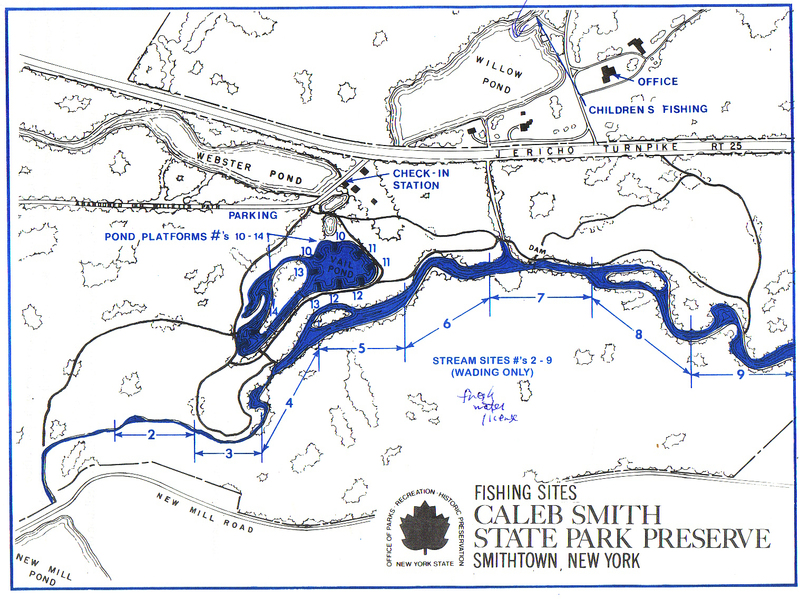 The river begins at Caleb Smith Park in Smithtown and flows to Kings Park, New York. Since much of the river is an estuary canoeists travel in both directions based on the tides. Fish found in the river include Striped Bass, Bluefish, Summer Flounder, Winter Flounder, Porgies, Eels, Brown, Rainbow and Brook Trout, Yellow Perch, Largemouth Bass, Alweives, Herring, Shad, etc. Reservations may be made up to two weeks in advance, beginning March 15th at 8:00 a.m. by calling (631) 265 1054 or visiting the park office. Reservations accepted for 30 sites available per session. Specific sites cannot be reserved in advance but are issued first-come-first choice at time of session. NO SHOW POLICY: Abandonment of reservations will result in cancellation of your remaining reservations. Sign-in begins 30 minutes before each session and unclaimed reservations are abandoned 20 minutes after the start of each session. Valid permit required while fishing. Permits issued for current session only. Have permit available at all times when fishing. Permit expires upon possession of limit, violation of any posted fishing rules or end of time session. Two (2) Trout per person 9 inches or over. One (1) largemouth pass per day 18 inches or over from July 1st to October 15th. One rod per person at any given time. Fly fishing equipment and tackle only. Flies or streamers of natural or synthetic materials constructed in normal fashion wound on or about a barbless hook. No more than two anglers on a site (beat) at any given time. Net and release fish carefully. Release your fish in the water, immediately, with care, and in the same condition it was taken. NO injured fish are to be released. Felt sole waders. Barbed hooks. Weights attached to leader lines. Bait, including live, scented and pellets. Molded facsmilies and/or replicas of fish, fish eggs, eathworms, insects or any vertebrates or invertebrates. Stringers or other methods of restraining or tethering fish in the water. Fish kept must be quickly and humanely killed and creeled. Please do not litter. Kindly carry out everything you have brought in - paper, fishing gear, etc. Prevent forest fires, No Smoking in woodlands. Also check out Suffolk Fishing Regulations and Statewide Fishing Regulations.